In the race to build the boldest pickup truck on the market, there are two new entries: the Ram Black Express and the Ford Tremor. Both vehicles sound impressive, but the winner will need more than just an intimidating name to beat the competition. The Ram Black Express lives up to its name. The black exterior, with its black front fascia, black rear bumper, 20-inch black aluminum wheels and unique black Ram badges, is guaranteed to turn heads. Buyers can choose between a standard cab, quad cab or crew cab. The base model features rear wheel drive; four-wheel-drive is an available option. The Ram has a 5.7 liter Hemi V8 which produces a fierce 395 horsepower and 410 pound-feet of torque. A six-speed automatic comes standard. The maximum tow rating is 9,250 pounds and a maximum payload of rating of 1,660 pounds. The starting price is a budget-friendly $28,250. Although there are a lot of options to customize the Ram Black Express, buyers who want a color other than black will have to look elsewhere. Fuel economy is a disappointing EPA estimated 14 city/20 highway. Interior options are limited to a smoker’s package, single CD player, and a back-up camera. Buyers looking for high tech options or luxury won’t find it here. 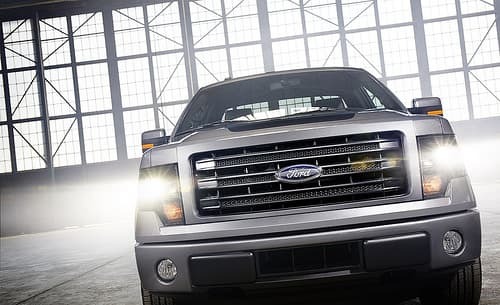 The 2014 Ford Tremor is a sport truck that lives up to the F-150 name. A 3.5 liter V6 EcoBoost engine produces 365 horsepower and 420 pound-feet of torque. The short wheelbase and 4.10 rear axle delivers fast acceleration. The truck’s FX Appearance package includes flat black accents, 20-inch black wheels and a graphics package. Fuel economy is 16 city/22 highway, which is a slight improvement over the Ram. The truck’s interior is attractive. Black leather bucket seats feature Alcantara inserts and red piping. MyFord Touch communication and entertainment system is standard. It includes a color LCD, Bluetooth and Wi-Fi connectivity, and text messaging. Buyers will find the Tremor disappointing in some respects. The truck is only available with a regular cab in two-wheel or four-wheel-drive. The Ford’s EcoBoost engine promises better gas mileage, but it is only slightly better than the Ram. Buyers may choose the larger V8 over the V6. Buyers looking for a larger engine with the Hemi prestige and options for larger cabs should consider the Ram Black Express. Buyers looking for the latest in car technology and a more luxurious cab should look at the Tremor.